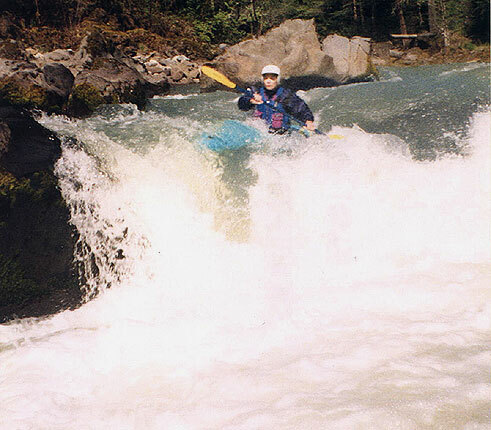 Mike Haley first explored Jackson Creek Gorge and the Cover Camp section in 1998. We're reasonably sure it had been run before but we couldn't find any information about the first descent. 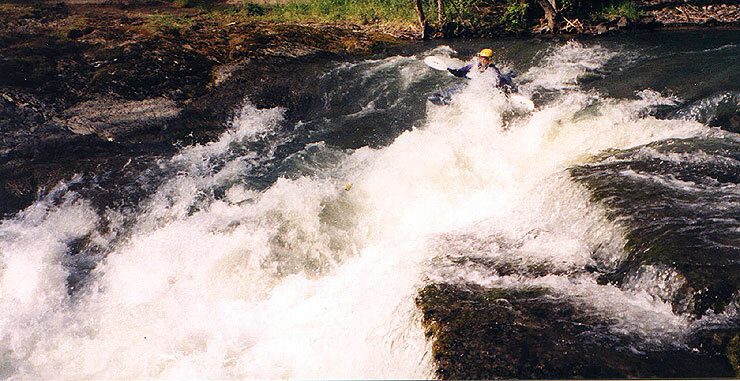 This lower section of the creek is a worth doing and has a couple challenging class IV rapids to keep you on your toes. Jackson tumbles out of the scenic Umpqua National Forest and has a wide, woodsy feel. Be sure to check out the world's tallest sugar pine if you paddle this section as the creek flows right past it! (It's marked on the Oregon Gazetteer). Below Cover Camp the creek is much mellower than the gorge section, with many small rapids and three more difficult drops. There are a few logs but they are easily avoided by competent class III paddlers. The road is well concealed from the creek but is always nearby in the event of a mishap. We rated the lower run class 3(4) as there are numerous ledges and rapids, far too many to remember. After putting on at Cover Camp (below a mandatory portage log), the first mile has a few short but fun mini-gorges to keep paddlers entertained. After the first mile, Squaw Creek enters on the left over a nice 4-5 foot falls and the volume of the creek noticeably increases. A couple of miles downstream an anchored log spans 95% of the streambed. At higher flows it could be boofed, but we had to portage. After several straightforward class 2 and class 3 ledges and rapids, you come upon a definite horizon line with mist coming up over it- Scout left. He decided to run the ledge on the right, missed the boof, and penciled in. When he surfaced he was immediately slammed against the right wall cockpit-first and was then dragged face-first along the wall upstream for another trip through the hole. After a couple of drag-pummel-flush cycles he swam and got pushed downstream around the corner with his boat into another wall. The hydraulic was so strong that it sucked the booties off his feet, hence the name. This ledge can be seen on the drive up but it merits a scout once you are on the creek! Dustin about to get worked hard at the 'Bootie Call'. A half mile below here is a fun 8 foot ledge slide drop, and then paddlers arrive at the main event, a large class IV double drop known as Gatekeeper. (scout on the right). At gatekeeper the creek drops over a long slide that is usually run on the far right, skirting a scary, foaming crack in the middle of the creek. Just below this slide the creek narrows down and drops through a large hole that flushes at most flows. Gabi skirts the nasty crack in the first drop on the Gatekeeper. HAZARDS: The three class 4 drops mentioned above, as well as logs. Bootie Call and Gatekeeper can be seen from the road on the drive up, approximately 6.2 and 4.8 miles, respectively, upstream from the Jackson Creek turnoff. All are easily river scouted. ACCESS: Drive up South Umpqua road for about 6 miles to FS 29. Take a right and drive a mile or so. Take out below FS31 bridge, anyplace where the creek and road are close to one another. Cover Camp is about 12 miles upstream from the turnoff, and makes a great base of operations. GAUGE: Based on the size and drainage of Jackson Creek, we estimated the flow to be about 30-35% of the flow of the South Umpqua at Tiller. Thus, when we ran it there was about 450 cfs. The flow graph linked here is generated by Pat Welch on his Oregon flows Page. Thanks Pat!